Paul the Deacon (720-799) is known mainly for his writings as a historian, but he also composed a commentary on the Rule of St. Benedict, and this widely used collection of homilies. 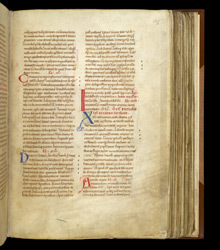 Although it was perhaps written and decorated in Normandy, this manuscript was at Glastonbury Abbey by the end of the Middle Ages. The right-hand column shows an example of a corrected mistake. The scribe left a space for a coloured initial, and wrote the letters 'PM' with an abbreviation mark. The artist later painted a green initial 'S', because 'SPM' is a common abbreviation for 'Spiritum' (Spirit). In fact, the first word of the sentence should be 'Christum' (Christ), which can be represented by the letters 'XPM'. When the mistake was realised, the green 'S' was erased and replaced by a blue 'X'.